Eighty nine beautiful women from all over the world have gathered at the Planet Hollywood Resort and Casino in Las Vegas to battle it out for the much coveted title of Miss Universe 2012. This preliminary stage helps to determine the 16 semi-finalists that will be announced on pageant night on December 19 together with results of the ongoing online voting on the Miss Universe website. 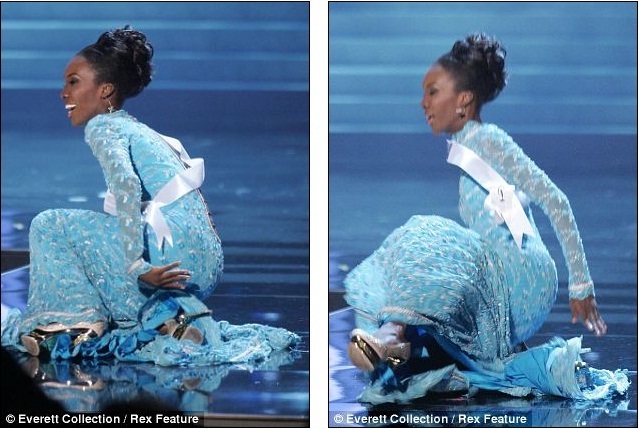 'Rounds' at this stage in the competition included posing in bikinis and evening gowns, but unfortunately for Miss Guyana she became a fashion victim of her floor-sweeping evening dress and crashed to the floor in front of the judges last night in Las Vegas. The remaining 88 contestants must have assumed they were all one step closer to winning the Diamond Nexus Crown as the combination of a shiny catwalk, skyscraper heels and a floor-skimming gown proved disastrous for the pretty South American. The pageant began as a local 'bathing beauty' competition spearheaded by Catalina Swimwear in Long Beach, Califiornia and is now an international annual tradition. The contest has evolved into a year-round international organisation that claims to advance and support opportunities for these young women. The competition aims to award women who are savvy, goal-oriented and aware and believes that women compete with the hope of advancing their careers, personal and humanitarian goals.